PHNOM PENH, Cambodia — Prumsodun Ok deeply loves classical Khmer dance. 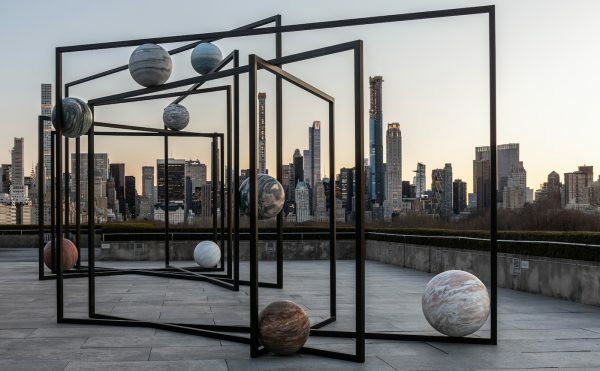 As a choreographer and dancer, Ok can exquisitely articulate the dance’s movements through his body, as well as their meanings and history through words. As a gay, Khmer-American man born in Long Beach, California, based between there and Phnom Penh, Ok thinks a lot about the voices and bodies of minorities. Finding what relevance and intersections this ancient dance can provide for minorities is one of his central missions. Classic Khmer dance has played a powerful role in Cambodian society for over a thousand years. Royal court dancers regularly performed for important international guests, even traveling with the king outside of the country as cultural representatives of Cambodia. The dancer’s beauty and talent came to represent the best of the kingdom both nationally and abroad. Classical Khmer dances are also revered as near-divine. They not only have been understood as mirrors of the heavens and gods, but are also believed to affect those heavens. During times of drought the Royal Palace dancer would perform the Buong Suong, a powerful ceremonial dance calling on the rain to aid the predominantly agrarian society. In his book Moni Mekhala and Ream Eyso (2013), Ok reimagines one of the dances performed for the Buong Suong within the context of the modern-day empowerment of women. Featuring contributions from one of Ok’s core teachers, famous Khmer choreographer and director of Khmer Arts, Sophiline Cheam Shapiro, the book recounts the story of Moni Mekhala, the goddess of the seas. Notably, Moni Mekhala is a strong woman who uses both her wit and humanity to overcome a mighty male demon, Ream Eyso. Growing up to refugee parents in Long Beach, and attending dance lessons as the sole male in a group of all Cambodian women, Ok saw the difficulties that women of color and immigrant women faced in the US, and sought to enlist and reconsider his cultural heritage as a relevant and empowering tool for those around him. In his retelling of the story, Ok places particular focus on Moni Mekhala’s character, situating classical Khmer dance as a long and influential tradition that can be subtly molded for social values today. It took years for Ok to gather the courage to ask Shapiro to join her dance lessons, which were at the time only attended by women. As a gay man in love with a dance considered almost entirely for women, he long wondered what place his identity had in his own culture. In Khmer culture, Apsaras (female celestial spirits) are considered to embody the highest form of beauty, and have come to represent Cambodia almost as much as Angkor Wat. The most revered dancers in Cambodian history, and to this day, are women. Furthermore, in the Khmer language, the phrase for “straight man” is “ប្រុសពិត” (pronounced “broh pet”), which literally means “true man.” Suffice it to say, Ok’s identity in performing these traditional dances has been greeted by others with confusion, and even anger. In 2013 at California State University Long Beach, Ok performed Robam Apsara, one of the Khmer tradition’s most cherished dances, nearly naked. Aside from his attire, which was simply a paired-down version of traditional costuming, Ok put on a faithful and indeed masterful performance. He did not contest but rather embodied the sensuality and delicacy the dance demands. How encouraging for queer Cambodians, to see a gay man boldly embodying one of Cambodia’s highest art forms. Celebrated and hated for the work, Ok’s performance marked a divisive point in his career. Unlike the relatively safe spaces Ok had been performing in, such as Redcat in Los Angeles and CounterPulse in San Francisco, he wanted to reach a larger, and especially Cambodian audience, and uploaded the video onto Youtube. Comments on the video ranged from celebration, bewilderment, to even threats of physical harm. There is a concerted effort among Cambodians to preserve their traditions, which they believe are a sacred aspect of their identity, so that wandering from those practices (through remixing, updating, changing, and so forth) can be seen as a destruction of culture. Ok recently gave a lecture on the role of men in traditional Khmer dance at the Art History Forum in Phnom Penh, “a platform for meeting and talking about Cambodian and other art histories,” founded by artist as well as director and co-founder of Sa Sa Art Projects, Vuth Lyno, and Roger Nelson, a PhD candidate at the University of Melbourne. The lecture confirmed Ok’s deep respect for and knowledge about classical Khmer dance, while ensuring us of his and his troupe’s right to perform these works. The evening ended with four performances from Ok’s new company Natyarasa, the first-ever all-male, all-gay Cambodian dance troupe. Now, if these dances do indeed serve as a mirror of the heavens, there are finally gay angels, and they dance beautifully. It is Ok’s hope that, through these performances, queer bodies can finally have a valuable and respected place in Khmer culture. The rains will still come. The costume changes and modern songs incorporated into the four performances did not compete with or overshadow the traditional movements that dominated the choreography. In Ok’s work, grace and history remain strong, providing a platform to show the talent and relevance of gay bodies in Cambodia today. Three of the dances were duos, beautifully highlighting intimate moments of love between the two dancers. 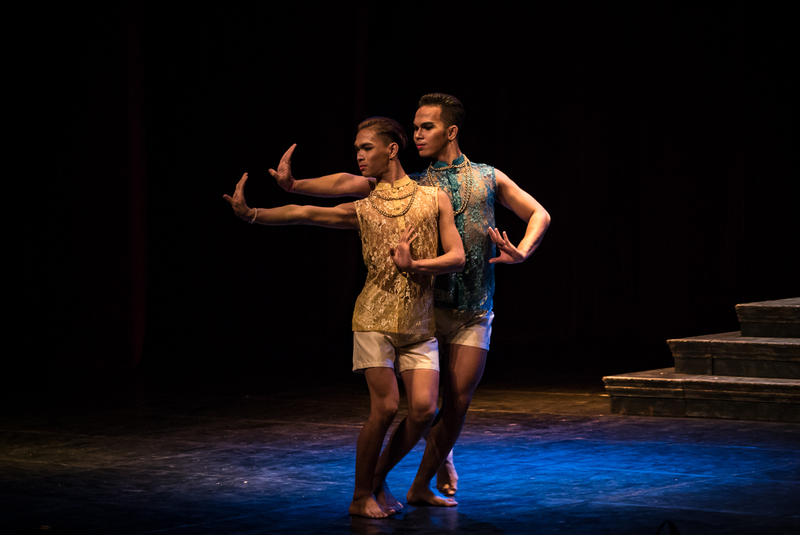 One performance, Ok told me over lunch, “invites spirits and gods to come and witness the marriage of two gay men.” The original dance tells the story of the demon Mara, who, right before Buddha’s enlightenment, scared all the gods away who had gathered to bear witness. Buddha summons Phra Mae Thorani (Neang Thorani in Cambodia), the goddess of the earth, to defeat Mara through a flood, and guarantee the presence of the gods. Ok’s performance adopts this story to assert a divine right to love as a gay man, a right that lacks societal support. “I don’t need the approval of any human being to love, to be who I am,” said Ok.
At the end of the performances, during the Q&A, Ok quoted a poetry teacher of his as saying, “love produces the highest art.” These performances, both old and newly choreographed, come out of Ok’s love for the form, a love of Cambodia’s culture, but also his own personal love. 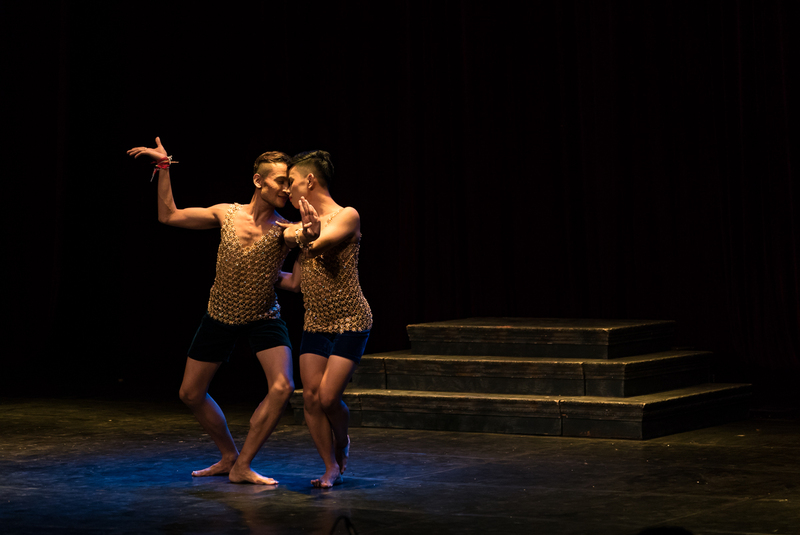 In bringing these passions together with sincere respect and talent, Ok performs a contemporary Cambodia where an embrace of tradition, contemporary art, and queer identities is possible.